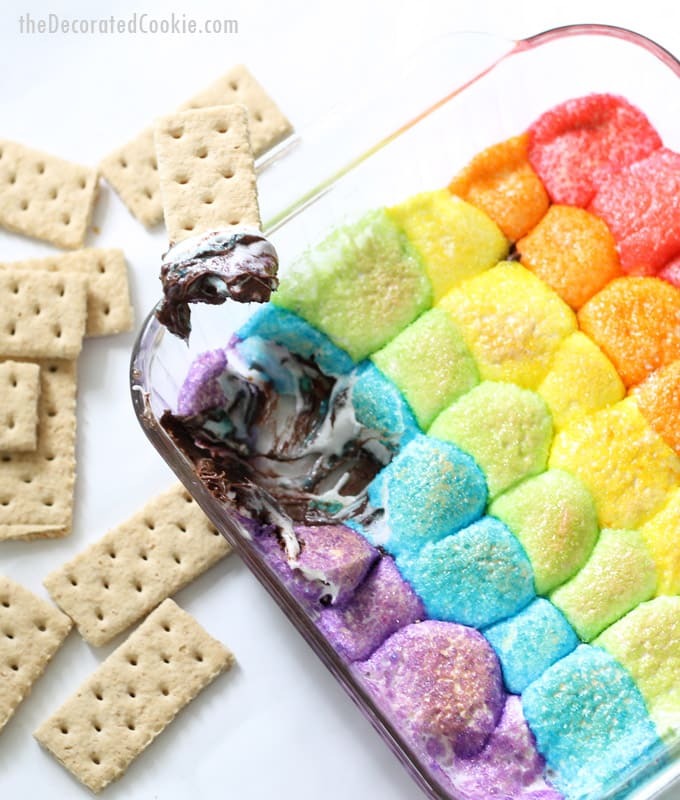 This rainbow s’mores dip is up there in the top “favorite things I’ve ever made.” It’s super-crazy delicious, colorful, EASY to make, and needs only a few ingredients (well, it uses a lot of sprinkles, but I had those already, so I recognize I’m at an advantage there). I picture this as THE dip to have at all parties involving unicorns, fairies, and elves. 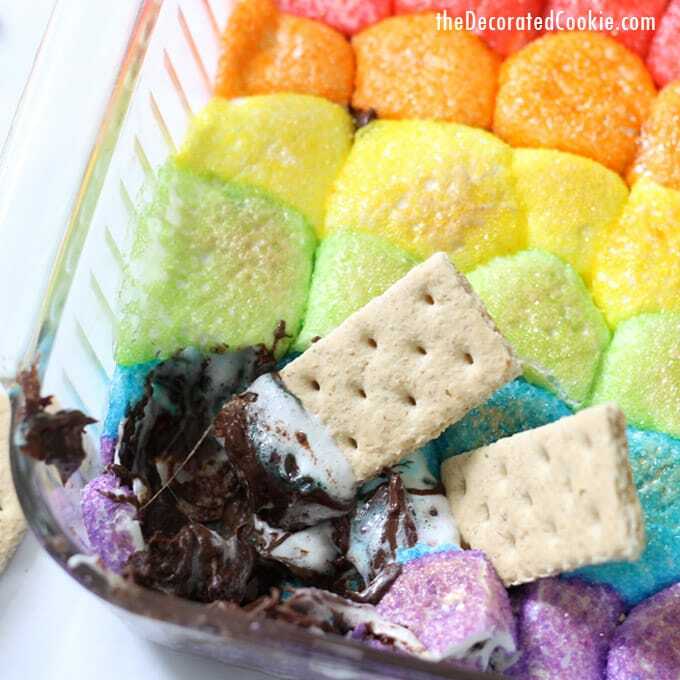 Maybe I’ll subtitle it “Unicorn S’mores Dip” what with this current unicorn crazy surrounding us all. 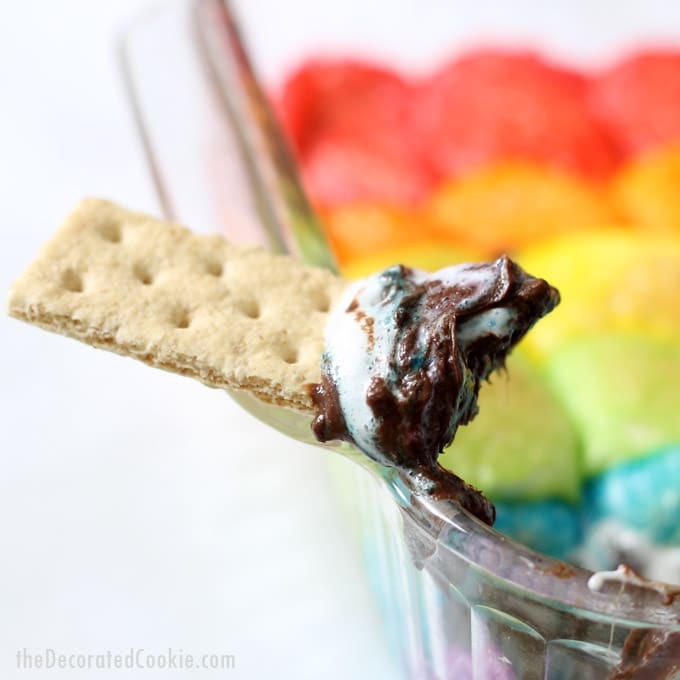 Having a go at the s’mores dip was inevitable for me, I think, what with my s’mores history and love of rainbow marshmallows. 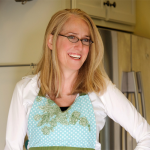 Here, I use my now-classic sprinkles marshmallow method (simply dip the marshmallow quickly in water and coat with sprinkles) to top chocolate. 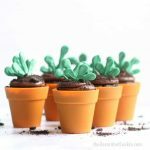 The beauty of this method is that the sprinkles form a perfect crystallized topping to the dip so you get the most divine combination of chocolate, creamy marshmallow, and sweet crunch. *Find sprinkles in the craft store. 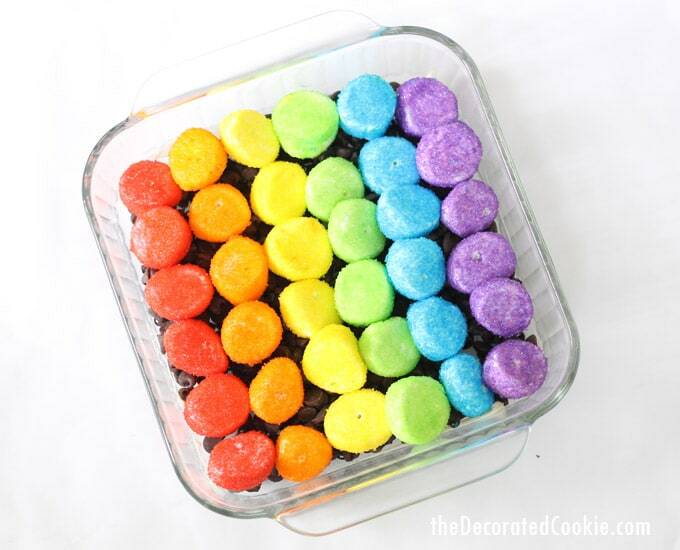 Here, I used Wilton sparkling sugars in red, orange, yellow, green, blue, and purple. First, prepare the marshmallows. 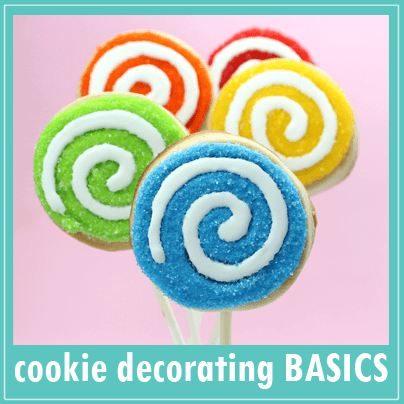 Have ready a baking tray lined with wax paper, marshmallows, toothpicks, a paper towel, and the sprinkles. 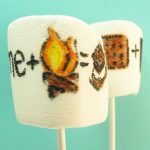 Skewer a marshmallow with a toothpick, submerge it totally in water quickly, dab on the paper towel, hold over a bowl and cover completely with red sprinkles (both the top and bottom, too). Prepare three marshmallows with red sprinkles. 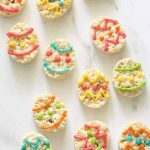 (If any part of the tops are missing sprinkles, just add some with your fingers.) 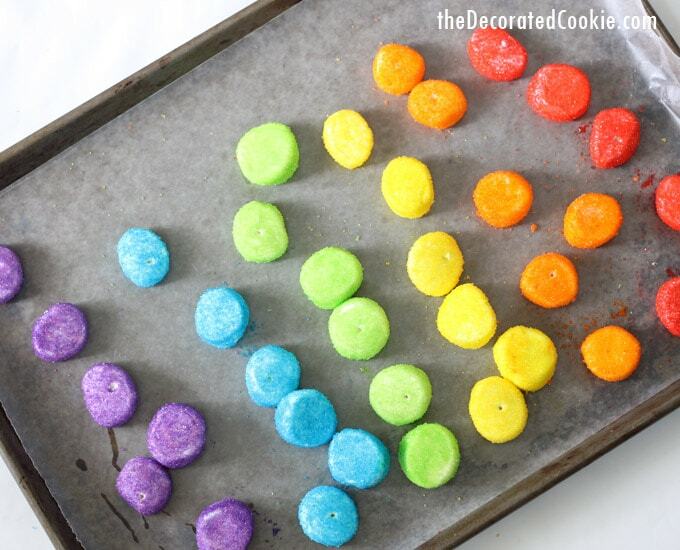 Repeat with each of the other colors so you have a total of three of each color. Let dry at least twenty minutes. 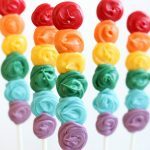 Grease some kitchen scissors with butter or Crisco and cut each marshmallow in half, wiping the blades clean between colors. Next, prepare the s’mores. Grease the baking dish with butter or Crisco. Pour the chocolate chips evenly in the dish. 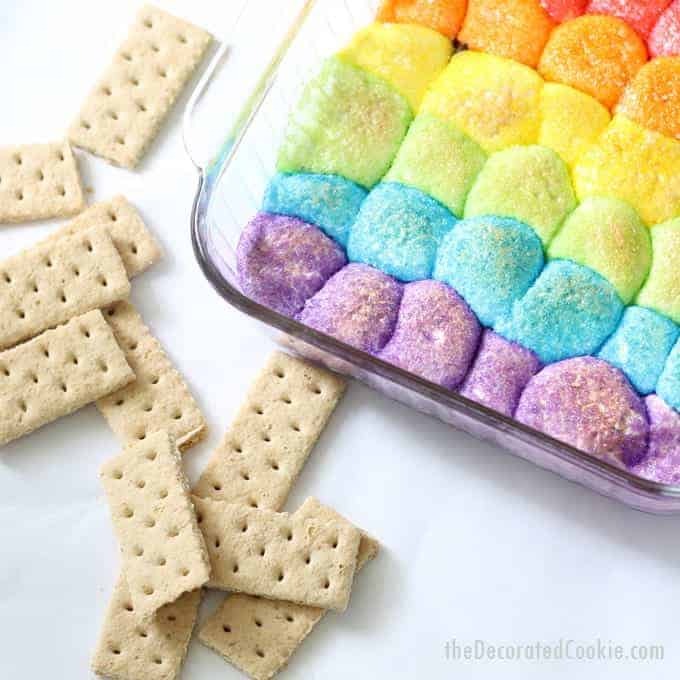 Top with the marshmallows, cut-side down, arrange in a rainbow pattern. First, prepare the marshmallows. 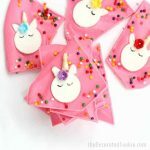 Have ready a baking tray lined with wax paper, marshmallows, toothpicks, a paper towel, and the sprinkles. Skewer a marshmallow with a toothpick, submerge it totally in water quickly, dab on the paper towel, hold over a bowl and cover completely with red sprinkles (both the top and bottom, too). Prepare three marshmallows with red sprinkles. 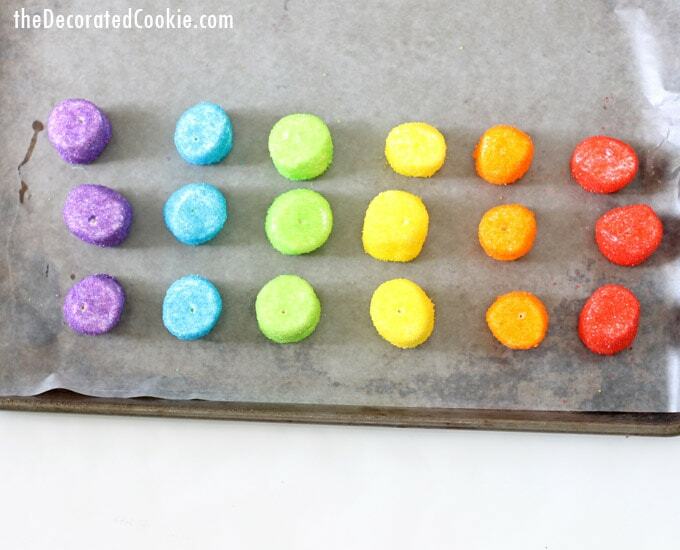 Repeat with each of the other colors so you have a total of three of each color. Let dry at least twenty minutes. 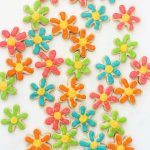 Grease some kitchen scissors with butter or Crisco and cut each marshmallow in half, wiping the blades clean between colors. Next, prepare the s'mores. Grease the baking dish with butter or Crisco. Pour the chocolate chips evenly in the dish. 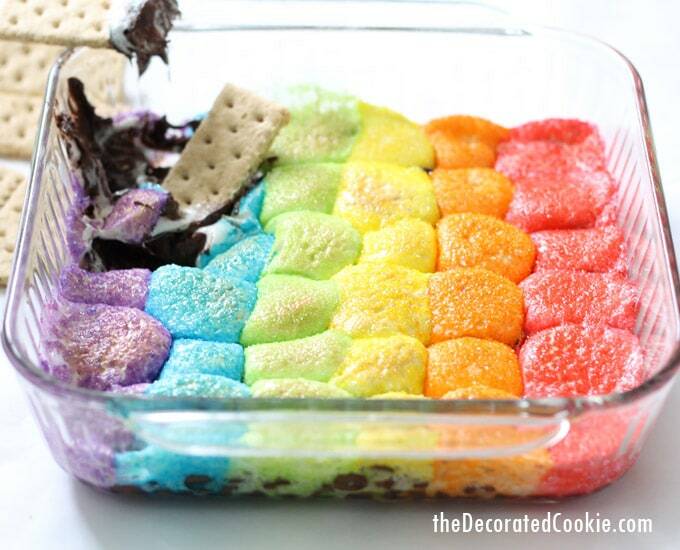 Top with the marshmallows, cut-side down, arrange in a rainbow pattern. 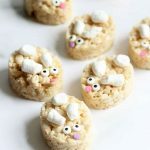 Bake in the oven for 7 to 9 minutes, just until the tops of the marshmallows start to brown. 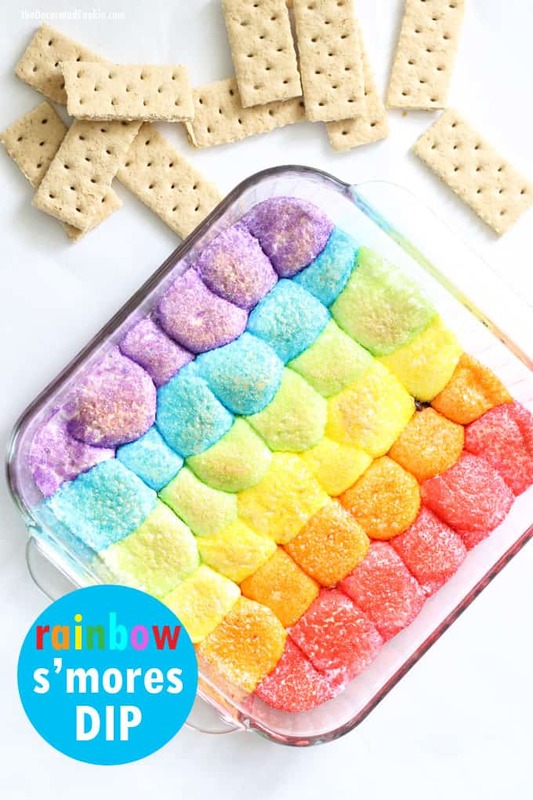 Serve with graham crackers and/or pretzels and enjoy!! 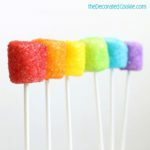 If you like these, you might like these vodka-dipped rainbow marshmallows, too.